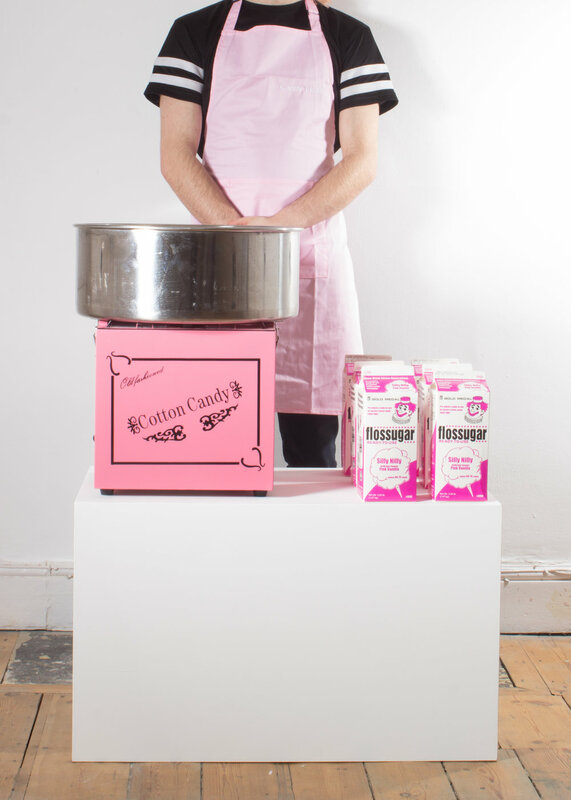 Candyfloss, 2017, audience participation and replenishable candyfloss, dimensions variable. Candyfloss takes its inspiration from the carnivalesque, a concept developed by Russian philosopher Mikhail Bakhtin in 1972. For Bakhtin, the carnival represented a positive utopian vision where all carnival-goers would temporarily become participants, by leaving behind society and following the behaviours and rituals of a new way of life. The carnival, with its prospect of freedom and fun, as well as a disregard for pre-existing rules, is much like eating candyfloss in an art exhibition. Upon encountering the work, participants are able to queue up and take a numbered ticket from the candyfloss stand and wait for their number to be called. Although this waiting time may vary, as well as sometimes seeming unnecessary and unfair, participants are aware of the outcome of free candyfloss and therefore must decide whether or not the wait and the desired result is worthwhile. It is important to consider with this work, that if this apparent freedom should come without rules then why must each participant first take a ticket, and why must they wait their turn? Why does each participant have to wait at all just to get what they came for?